The Ocean Born Flying Popper features a classic design with uncommon castability and action. The Ocean Born Flying Popper Lure features a classic design with major enhancements when it comes to castability and versatility. Its side wings enhance aerodynamics and give the lure lift once it is in the water. 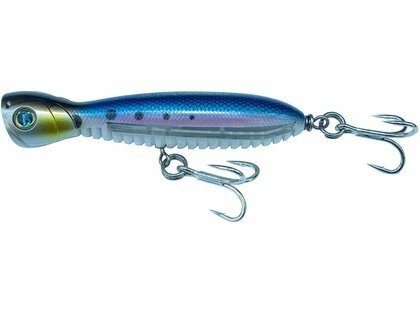 Ocean Born Flying Poppers come in Floating, Sinking, and Super Long Distance models, with 4X treble hooks on the Floating and Sinking models and 6X treble hooks on the Super Long Distance models.